A practical and informative guest post. Back in September, I received an email from a Paige Johnson. He offered to write a guest post for Learning from Dogs. Now I love guest posts simply because I think that different perspectives are always valuable, and let’s face it you get enough of me ‘rabbiting on’ most days. I reached out to your recently with a guest article offer and just wanted to send a quick note to follow up. I’ve had my dog, GG, since my early 20s, and though it wasn’t easy — in fact, it was quite the trial and error process for both of us! — I’m happy to report that she has become a well-trained pup, great with kids, adults, and other animals. That said, GG and I are about to face another challenge together. Moving. I know that uprooting her from the only home she’s ever known won’t be easy for her so I’ve been doing some research on how to make the process go as smoothly as possible for both of us. I run LearnFit.org with some friends, and collectively, we love helping readers find balance in their life. Adding a dog to the mix definitely brings happiness, but it can be a tough adjustment, especially when you face another big life event, like moving or having a child. Who wouldn’t warm to that approach! So here is Paige’s guest post. When you become a new dog owner, you worry about what to feed him, how often to bathe him, the best type of flea and tick treatment to use to protect him, and a litany of other things involved in caring for him. You also need to make sure that your veterinarian is on the same page with you so that you are comfortable with relying on him to deliver the best quality care for him and advice for you. Sometimes, however, you need to break up with your vet for one reason or another. If you are a new dog owner who needs to break up with your vet, we offer four tips to help you do it as quickly and painlessly as possible. If you are having a difficult time deciding whether to leave your veterinarian, think about how you have been treated by the vet and his office staff and how your new dog has been cared for at the office. If your vet has been pushing you to purchase pet food and care products from him, or he has a policy that you must board your dog only at his office when you go out of town, you most likely are justified in thinking that it is time to break up with him. Vets who try to monopolize services unfortunately are in the business more for making money than for providing quality animal care. As a new dog owner, you need to be aware of your right to feed your dog whatever food you feel is best for his nutrition and health and not just what your vet sells. You also have the right to choose a dog boarding provider who will provide one-to-one care for your dog while you are out of town, rather than put your dog in an impersonal kennel at the vet’s office. When you leave the vet, you should consider all of the interactions you have had with him, and if you feel that you are being pushed into choosing products and services that he offers without having a freedom of choice, you should break up with him. As soon as you feel that you need to break up with your vet, you should take action. Breaking up with your vet sooner rather than later will make the process much easier on you. Prolonging your relationship with your vet when you are considering cutting ties with him will increase your uneasiness and make an awkward situation even more uncomfortable. You especially need to break up with your vet as soon as your instincts tell you to do so if you are concerned that he is not providing adequate care for your dog. The last thing you want is to put your dog’s health in jeopardy because you are afraid to break up with your vet. As a new dog owner, it is your responsibility to put your dog’s health above everything else when you deal with your veterinarian and make decisions regarding his treatment and care. You want to be sure you have a new veterinarian on board with your new dog before you leave your old vet’s office, so that your dog’s health is never at risk during the transition. Call your current veterinarian’s office and politely ask office personnel to transfer your records to your new vet. Even if you have had issues with office staff before, it is well within your rights as a pet owner to switch vets and have your records sent to the vet of your choice. The staff should treat you with professional courtesy as long as you are straightforward and polite as well during the interaction. Sometimes, even people who love their veterinarians need to break up with them because of extenuating circumstances. For example, you may be moving to a new town and cannot take the time to drive to your current vet’s office from your new home. 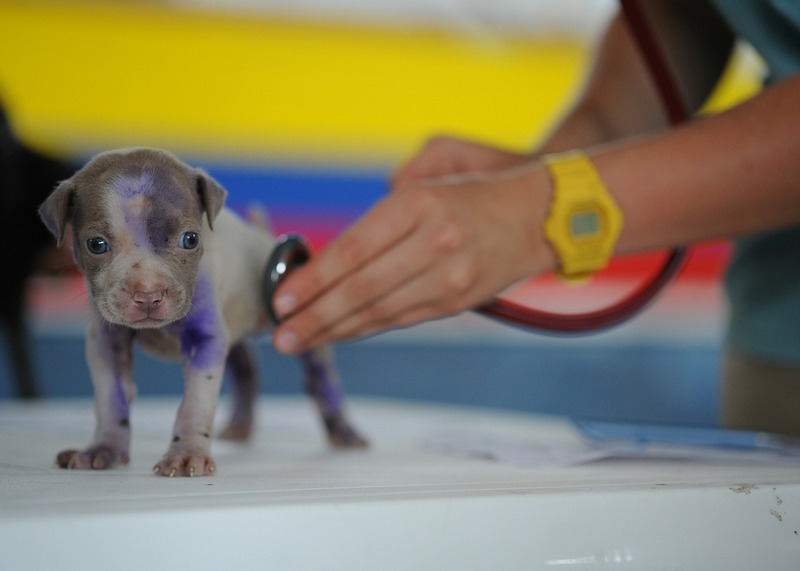 If you have been happy with the care from your veterinarian and are sad to leave his care, explain the situation to him and ask for some recommendations for your new area. Your vet may be able to refer you to a new office that shares his level of care and commitment to your new dog. Your vet also may be able to refer you to other services for your dog in your new area, such as reputable dog walkers or accommodating dog parks. Breaking up with your veterinarian is not a fun thing to do for new dog owners, especially if you love your vet and don’t want to leave his care. However, you need to put your dog’s health first, and if your current veterinarian cannot meet your dog’s needs, it is time to break up and go elsewhere. Our four tips will make the process easier for you. Yes, we always “need to put your dog’s health first” and Paige offers some valuable advice for ensuring that is always our top priority. Five years: Just like that! Unfortunately in the last 4 years, we have had to break up with vets that we loved due to moving. Paige does give some invaluable advice. Thanks Susan. Likewise when we moved from Arizona to Oregon back in 2012. Although, thankfully, here we have a great neighbor who is also a great vet who introduced us to a very attentive veterinary practice in Grants Pass, our local city. Paige will be pleased to read your comment. When we lived in Phoenix we had a great vet. We always manage to find them because we do the research. A great guest post Paul, and yes that trust between your Vet is vital.. And thankfully had wonderful respect for my vet and her amazing insights too on how we as pet owners feel about our pets..
Oh, I wonder if your lady vet could be tempted to write up some of her insights? Want me to make contact with her? Its a few years now since I have been Paul, having been petless for a while now.. apart from a tropical fish tank and garden fish pond.. She is however I am sure well over retirement age by now, but my daughter takes her cats to her still. She is also one of the best in the area as a horse vet.. And has all the state of the art equipment to xray them and often does major operations on them I found her vets website.. where we took all our cats.. She was excellent with them.